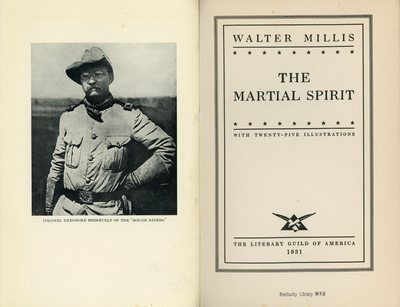 "The Martial Spirit" by Walter Millis (Cambridge, Massachusetts: Riverside Press, 1931). Chapter titles include: The Setting of the Stage, Insurrection in Cuba, Cuban Liberty and American Politics, Mr. McKinley's Policy of Peace, The Destruction of the Maine, The Crusade is Launched, Manila Bay, Splendid Improvisation, The Advance on Santiago, San Juan Hill, The Navy's Fourth-of-July Present, The Rewards of Virtue, and Peace and the Senate. This book is available for use in Library Special Collections at WKU; 270-745-5082; spcol@wku.edu.